Parking lots can be dangerous places. According to the National Safety Council, more than 50,000 auto accidents 60,000 injuries and 500 deaths are reported in parking lots every year; parking lot accidents account for more than 1/5 of all reported auto accidents. These accidents expose property owners to potential premises liability claims. Distracted driving is the culprit for many of these parking lot accidents. Most people let their guard down when they get off the road and into a parking lot. They feel that once they have reached the parking lot, they are safe. According to the National Safety Council (“NSC”), this is not the case. “Parking lots are intense driving environments that require both drivers and pedestrians to pay close attention.” “It’s just as dangerous to be distracted in a parking lot going 5 mph as it is going 50 mph,” said Deborah A.P. Hersman, president and CEO of the NSC. That’s a lot of distracted driving. To make matters worse, many parking lots lack adequate signage and an orderly traffic flow. Traffic becomes chaotic, with cars coming from all directions. Even if a driver or pedestrian pays attention and looks in all directions, they still have to avoid others who are distracted or driving recklessly. Getting a driver’s attention in a parking lot is a competition. You must win out against a myriad distractions such as the ones listed above. 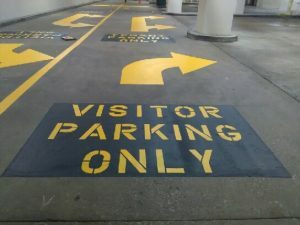 The two most common ways to get a driver’s attention in parking areas is through vertical signage and pavement striping. We recommend using both to complement each other, however, we believe parking lot striping is more effective. Visible and effective striping can only be accomplished with fresh, bright paint. Click here to see a video of how C & D creates signs with striping. Have you ever been in a parking lot where it is hard to see where to go or where to park because the paint is old? Or have you ever been in a parking garage where it was difficult to find the exit? Poor/old striping can be frustrating and dangerous, especially at night. As striping paint gets old, it chips, gets covered by tire marks, dirt, gum, oil spills and other chemicals and debris. When this happens, it loses visibility and effectiveness. If drivers are struggling with hard-to-read signage, they are not paying attention to their surroundings – increasing the risk of an accident in your lot. If you don’t take your signage seriously by keeping it fresh, frequent and visible, neither will the drivers in your parking lot or parking garage. Care should also be taken to keep centerlines, parking stall stripes, arrows, handicap stalls, fire lanes, and other pavement fresh. Parking lot striping should be done with paint designed for traffic use and should have high visibility. Some traffic paint can even reflect light back towards the driver, making it especially effective in low-light conditions. 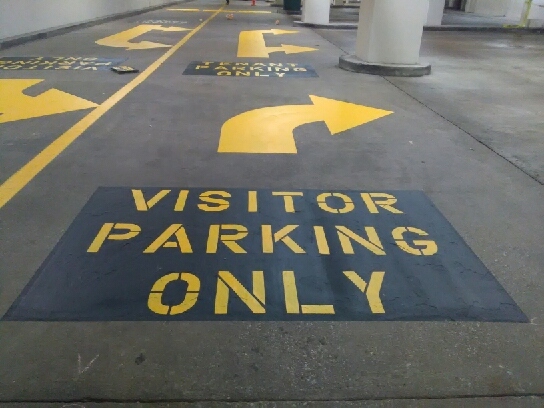 Parking lot striping is a great way to control the flow of traffic and add clarity to traffic instructions in your parking lot or parking garage. Striping is often used for the following purposes: stop signs on the pavement, directional arrows, to create one way drive lanes, to mark two way drive lanes, create cross walks, loading zones, file lanes, no parking zones, show visitors where they can and can’t park, reserve spaces for specific customers, etc. Use it in in conjunction with vertical signage to make sure traffic instructions are more likely to be seen by drivers and pedestrians. Have you ever noticed how many highway interchanges have pavement markings with information about where each lanes exit? These pavement marking are made in conjunction with vertical signs and they make it much more clear to the driver where they should go. Likewise, in a parking lot, parking lot striping should be used in conjunction with vertical signage. There should be no doubt about which direction to go, which parking spots are reserved, which spots are handicap designated, where the visitor parking is, where to stop, where to yield, where pedestrians cross, and how to exit. The more clarity and information you can provide to drivers and pedestrians, the fewer accidents you will have in your parking lot. 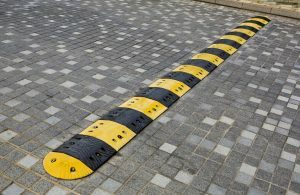 Speed bumps are often necessary to keep vehicles at a safe traffic speed in your parking lots. 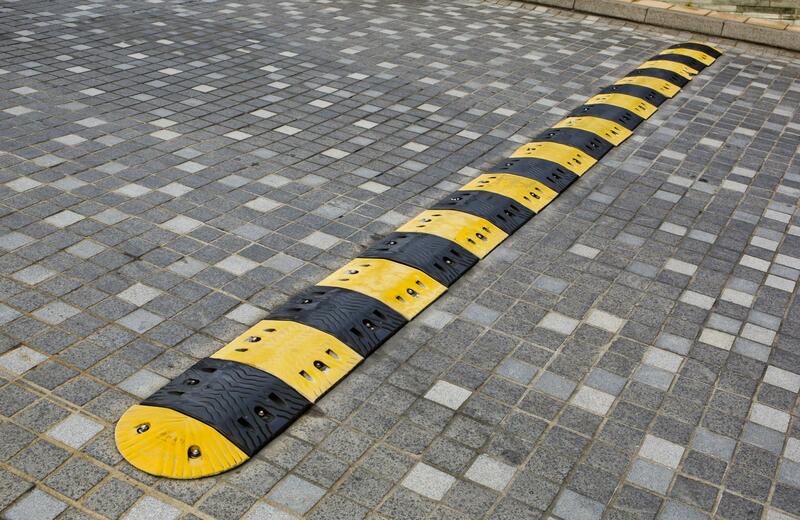 In particular speed bumps need to be used on long straight stretches, around pedestrian crossings, and areas where speeding or accidents tend to occur. Speed bumps not only make a driver slow down, but they also direct a driver’s attention back to the parking lot. A few well, placed speed bumps can greatly reduce the amount of accidents in a parking lot or parking garage and increase driver awareness. Overall, parking lots are a lot more dangerous than people realize and a property manager should take reasonable steps to make their parking lots and garages safe and orderly. Parking lot striping and speed bumps are an effective and low cost method for reducing reducing these accidents in a parking lot and parking garage. C & D Commercial Services, Inc., has been serving property managers in Dallas and Fort Worth since 1981. C & D offers many exterior property maintenance services including: sweeping, parking lot striping, pressure washing, concrete repair, masonry, paver repair, caulking, building restoration, waterproofing, and other services.